SMan - system utility that manages your UIQ device. It provides functionality which manufacturers did not provide or which are difficult or impossible to do manually. SMan helps keep your UIQ device running in a "healthy" state and, to a certain degree, allows you to customize the system behaviour of your UIQ device. SMan comes with a bluejack module, file manager, task manager, system information, database manager, today view, and much more. 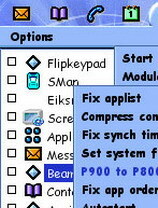 It also has a number of unique features such as snapshot and flush tasks on flipclosed. SMan also supports flipclosed operation.